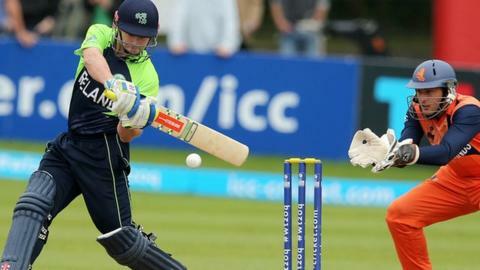 Ireland suffered a surprise five-wicket defeat by the Netherlands in Saturday's World Twenty20 Qualifier semi-final. The Malahide hosts could only muster 128, with Madassar Bukhari claiming four wickets as they were dismissed with one ball remaining. Ben Cooper hit 40 and captain Peter Borren scored an unbeaten 36 as the Netherlands cruised to 129-5 in 18.1 overs at the Dubllin venue. The Netherlands will take on Scotland in Sunday's decider at Malahide. Both sides had already secured their place at next year's World Twenty20 in India as two of the top six qualifiers. Ireland were favourites to make the final but they failed to set a competitive target. Kevin O'Brien top-scored with 33 from 23 balls while Andrew Balbirnie (31), Gary Wilson (20) and Paul Stirling (18) also contributed. Bukhari impressed with 4-28 with Paul Van Meekeren (2-14) and Timm van der Gugten (2-16) also among the wickets. Ireland reduced the Netherlands to 16-2 but Cooper and Borren ensured the target was easily reached. O'Brien picked up 3-16 while there was a wicket apiece for Alex Cusack and Craig Young. Ireland are back in action on Sunday morning in a third-fourth place encounter against Hong Kong.